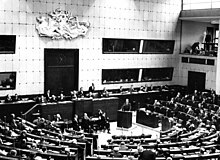 The Parliament's hemicycle ( debating chamber) during a plenary session in Strasbourg. 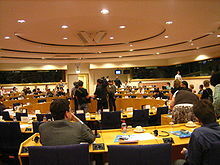 ^ "European Parliament". Europa. 19 April 2010. Retrieved 2012-12-08. ^ a b c Kreppel, Amie (2006). "Understanding the European Parliament from a Federalist Perspective: The Legislatures of the USA and EU Compared". In Menon, Anand; Schain, Martin A. Comparative Federalism:The European Union and the United States in Comparative Perspective: The European Union and the United States in Comparative Perspective. Oxford University Press. pp. 245–274. ^ Brunwasser, Matthew (14 January 2007). "Bulgaria and Romania bolster far right profile in EU Parliament". International Herald Tribune. Retrieved 2007-07-07. ^ Economist (May 15, 2014). "Elected, yet strangely unaccountable". www.economist.com. 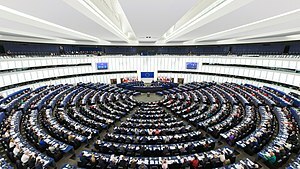 ^ "MEPs reject scrutiny of their expenses". www.politico.eu. July 3, 2018. 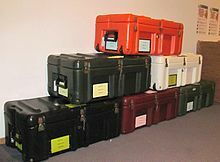 ^ "European Parliamentary Research Service". Europarl.europa.eu. Retrieved 2017-08-24. ^ "The work of EPRS – The first three years: 2014 to 2016" (PDF). European Parliamentary Research Service. Retrieved 2017-09-07. This page is based on the Wikipedia article European Parliament; it is used under the Creative Commons Attribution-ShareAlike 3.0 Unported License (CC-BY-SA). You may redistribute it, verbatim or modified, providing that you comply with the terms of the CC-BY-SA.